During the weeks after my son, Noah, was diagnosed with Down syndrome, I scoured the Internet for information. I know the saying “knowledge is power” sounds a little cheesy, but learning as much as I could about Down syndrome helped me understand the diagnosis and anticipate what to expect in the future. I came across a multitude of medical websites with straightforward explanations of what Down syndrome is as well as the physical and intellectual characteristics of Down syndrome, but I wanted something more personal. 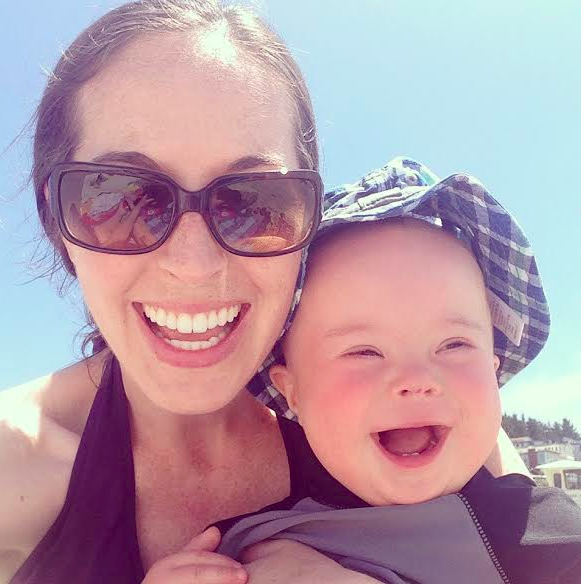 What it would actually be like to have a child with Down syndrome? Yeah, we were a little scared and surprised when we found out that our baby had Down syndrome, but now life is fabulous. Our life is so much better because our child has Down syndrome, and we wouldn’t have it any other way. Seriously? I had trouble believing this. I had just found out my baby would lag behind in all areas of development, would need physical, occupational and speech therapy and had difficulty hearing. He was hypothyroid, would be more prone to an abundance of other health issues and may never have a job or live on his own, along with many other uncertainties. And you are telling me you’re glad your child has Down syndrome? That you wouldn’t change any of these things? Yeah, right. You make your life look so perfect, and here I am feeling like mine is completely shattered. At that time (several weeks after Noah was born), I felt confident I would never be in that positive place. I still wake up some mornings and wish Noah didn’t have Down syndrome. I feel guilty about that because it feels like an insult to Noah that I wish he were different. But it’s so much more complicated than that — you can’t distill it down to a single feeling. Do I want Noah to be different from who he is? No. But does it make me sad to think he may face so many more obstacles than a typical child? Yes. Do I love him no matter what? Absolutely. I’d like to share what it’s really like to have a child with Down syndrome for me. No sugar coating, no pity party. Just the reality. 1. It really isn’t that different on the surface. I read somewhere that the first thing to know about kids with Down syndrome is that they are more like typical kids than they are different. I have definitely found this to be true. Despite additional appointments and therapy for Noah, he is pretty much like any other baby. Raising him requires the same things it did with my other son, Landon — patience, sleepless nights, love, selflessness and a sense of humor. Sure, Noah’s development is delayed, but he will eventually reach all the same milestones as a typical child. He is on his own timeline, and that’s perfectly fine. It’s taken me a while to arrive at this mindset, but it’s one I think most parents of kids with special needs must reach. Your child is going to develop at his or her own pace, and there is nothing wrong with that. I try my best to encourage Noah right where he is at without wishing he was further along. I would be lying if I said it wasn’t hard. It’s hard every time I see a child younger than Noah doing things he can’t do yet. It’s hard every time I have to call the insurance company or the doctor or physical therapist or audiologist. It’s hard to think about the future. It’s hard to be around typical kids his age. It’s hard when people first meet Noah and you see the question in their eyes. But you know what? Parenting a typical child is hard, too. It’s hard to get home from work and feel torn between playing with my boys and cooking dinner. It’s hard to find time to spend with my amazing husband and feeling like he’s not getting the time and patience he deserves. Anyone who tells you any kind of parenting is easy is lying to you. Yes, the challenges may be different with a child with special needs, but there are challenges with any child. 3. It puts things in perspective. Noah is now a healthy boy and is moving along with his development, albeit at his own pace, but I felt so much fear and uncertainty before he was born. As soon as the doctor mentioned a possibility of stillbirth, my whole perspective changed. I no longer prayed for a healthy baby — I prayed my baby would live. Yes, Noah’s diagnosis shocked us and is difficult sometimes, but he’s alive, healthy and happy. In light of that, my priorities and outlook have changed. I am able to better let go of anxiety about insignificant things and focus on what’s important. We have an incredible family, and I’ve delighted in seeing all of us grow closer over the last year. I’m thankful we live in a city with resources for families and leading specialists for children with special needs. I’m grateful for the abundance of support we have been given. Sometimes it takes something that seems like a tragedy to reveal a level of joy and appreciation you never knew existed. 4. If you are anything like me, you will cry… a lot. For me, parenting a child with special needs has been emotionally difficult. I have probably cried more tears in this past year than in all the years of my life combined. I was sad because I never expected to have a child with special needs, and it felt terrifying, lonely and overwhelming. I felt immensely inadequate as a parent. Mostly, I was sad for Noah — for the challenges he would face, the judgment he might receive and the differences he would feel. I felt guilty every time I was sad or upset by Noah’s diagnosis. It felt like I was insulting him, like it was an acknowledgement that there was something wrong with him. A friend told me, “You will feel everything from sadness to anger to grief and everything in between. And whatever you are feeling, it’s OK. Just let yourself feel it.” That was great advice. I realized I had to allow myself to go through my range of emotions. 5. There are many things to celebrate. With Landon, I took most milestones for granted. It was exciting when he took his first bite of solid food or his first step, but I never worried that he might not reach the next milestone. With Noah, we celebrate every milestone, and rightly so. The little guy works so hard to overcome his low muscle tone, and he deserves to be celebrated. Not only that, but Noah is such a happy little guy. What he lacks in mobility he makes up for in personality. 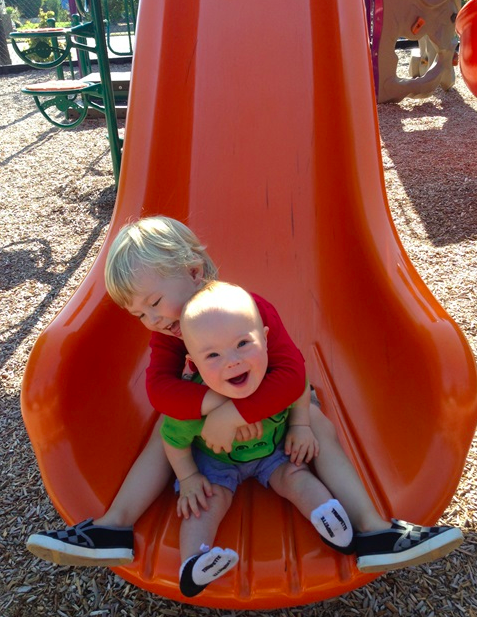 He smiles generously and makes his brother laugh regularly. He sways from side to side when he hears music, babbles all the time and loves to snuggle. He brings so much joy to our family. 6. You will hurt for your child. This one gets me the most. I ache for Noah when I see him struggle. He wants so badly to crawl right now. I can see his frustration as he tries to lift his stomach off the ground and reach for a toy, but his body won’t cooperate. I know I will watch him struggle throughout his entire life to do things that come easily to most kids. I know some people will judge him based on his diagnosis, and that breaks my heart. I don’t know if this hurt will ever go away, but I think it comes naturally with being a parent. As much as I want to shelter both my boys from any kind of struggle or hurt, I can’t. I can only do my best to raise them to be confident in who they are and love them like crazy. 7. There are lots of appointments. This may seem insignificant in the grand scheme of things, but the logistics of raising a child with special needs are demanding. The first several months felt like one appointment after another, specialist upon specialist, test upon test. And after all those tests and appointments, you have to research what the results mean, decide on treatment options and ask questions like “Will one additional therapy per week for Noah be beneficial, or will it make scheduling so difficult that we will all go crazy?” Making those decisions on top of work and managing a household can be stressful. 8. You will become a more compassionate person. You and those around your child will become more compassionate. I guarantee it. My mom told me this right after Noah was born, but I didn’t feel or see it happen until recently. The other night when I was putting Landon to bed, I asked if he had anything to pray for. He said he wanted to pray that Noah would have a good therapy session, and that he wouldn’t be sad when he had to get his blood drawn. I walked out of the boys’ room in tears that night. I hope other kids Noah encounters will learn to be more accepting of differences, and I hope the adults in Noah’s life will gain a greater understanding of those with special needs.